Check back in October for more details on Veterans Day Free Meals in 2019! If you're not seeing your favorite restaurant from last year, they may still be participating but haven't gotten back to me with their 2019 information. This list is updated many times a day, so keep checking back for more information. At the bottom of this list, you'll find free food that requires a purchase as well as some local restaurants that are giving out free Veterans Day meals. Important: Please read through my Veterans Day Free Meals FAQ for important information you need to know before getting your freebie or free meal, like military qualifications, restaurant participation details, and lots more. You can find even more freebies for vets on my list of Veterans Day Freebies and Discounts for 2019. Here you'll find freebies like free haircuts, car washes, and even hotel stays. All logos were provided by the respective establishment. TGI Fridays will be having free meal for all veterans and active-duty military on Sunday, November 11, 2018, as well as the following Monday, November 12. This offer is valid at participating locations only and is only valid after a military ID is shown for proof of service. Be sure to contact your local TGI Fridays for specific details. The Veterans Day free meal at Famous Dave's includes a Two Meat Salute. This offer is valid all day on both Sunday, November 11 and on Monday, November 12, at participating Famous Dave's locations. The Two Meat Salute is a choice of two different types of meat, including Georgia Chopped Pork, Country-Roasted Chicken, Barbeque Chicken, Sweetwater Catfish Fingers, Southside Rib Tips, Texas Beef Brisket, and Hand-Breaded Chicken Tenders, served with a Corn Bread Muffin and a choice of one side. Kansas, Missouri, and Nebraska customers get this free meal deal on Sunday only. Proof of service is required, which means you need to bring a photo ID and a US Uniformed Services ID card, DD-214 form, or current leave and earnings statement. This offer is for dine-in only. Active duty military, reserve, and military veterans can stop by Red Lobster and get a free appetizer or dessert on Sunday, November 11 and Monday, November 12, 2018. Valid proof of military service is required to get this free food. This Veterans Day free meal is on Monday, not Sunday. This year on Monday, November 12, IHOP will be honoring veterans and active military men and women with a free stack of Red, White, and Blueberry pancakes. Individuals must show proof of their service before receiving this offer, such as coming in their uniform, showing a photo of them in their uniform, or showing a military ID card. Continue to 5 of 97 below. Stop by Denny's on Monday, November 12, 2018, and all active, non-active, and retired military personnel can get a free Build Your Own Grand Slam Breakfast from 5:00 AM to Noon. This menu shows all the different items you can put together in a Grand Slam Breakfast at Denny's. Most Denny's locations should be participating in this promotion, and you'll need to bring a valid military ID along with you. This is for dine-in only. Important: This Veterans Day free meal takes place not on Veterans Day but the Monday after. On Monday, November 12, 2018, from 5:00 PM to 9:00 PM, Golden Corral will be giving out Veterans Day free meals and a beverage to any person who has ever served in the U.S. military or is on current active duty. This includes retirees, veterans, National Guard, and Reserves. All Golden Corral locations will be participating, and no identification is required to get your free dinner buffet and beverage. Over the last 17 years, Golden Corral served over 5.4 million veterans a Veterans Day free meal! White Castle is giving out a free Breakfast Combo or Castle Combo Meal (numbers 1-6) to any veteran or other military members who come in on Veterans Day, Sunday, November 11th or the day after on Monday, November 12th. Proof of military service is requested but might not be required. Every White Castle location is participating except for Las Vegas. This free Veterans Day meal is on Monday, not Sunday. Active duty military and veterans can stop by a participating Country Kitchen location on November 12, the day after Veterans Day, to get a free Country Scramble. Valid proof of service is necessary. This Veterans Day free meal offer is for dine-in only and cannot be combined with other discounts or offers. Continue to 9 of 97 below. Huddle House honors active duty, retired, and veteran military members this year with free Sweet Cakes all Veterans Day weekend. You can visit a Huddle House restaurant from November 9 through November 12, 2018, to get this Veterans Day free food offer. Proper military ID is required. Anyone with a valid military ID can have a free meal at K&W Cafeterias this Veterans Day. This offer is valid from 11:00 AM to closing on November 12. What's included is a meal, two vegetables, bread, and a refillable drink. Contact a K&W Cafeterias location near you to make sure they're participating. Participating Shoney's will be having a Veterans Day free all-you-can-eat breakfast buffet in 2018 for veterans as well as active duty military. Proof of military service is required, it's for dine-in only from open until 11 AM on the 12th, and beverages, tax, and gratuity are not included in the free offer. Find a Shoney's near you. Though this free Veterans Day offer isn't compatible with other offers and discounts, Shoney's also gives out a 15% discount all year long to the Armed Forces, Police, Fire Department, EMT Units, and anyone else with proof of service. On November 12, participating Chicken Salad Chick location is giving out a free Chick Special and regular size drink in honor of Veterans Day. Veterans and active-duty military can take advantage of this Veterans Day free meal if they can show proof of service. This can include a VA card, DD214 card, or military ID. Continue to 13 of 97 below. Veterans and active duty military can stop into a Hy-Vee grocery store with in-store dining and get a free breakfast on Monday, November 12, 2018, between 6-11 AM. You'll get to choose from a wide variety of breakfast foods set out on a buffet. All stores are said to be participating, but you might still check with a Hy-Vee near you to confirm. Active military members and veterans can stop in to Bruegger's Bagels for a free drip coffee of any size on Monday, November 12, in honor of Veterans Day. No purchase is necessary to get your free coffee. However, this deal is only valid at participating locations, and a valid military ID is required. Every Charlie Brown's location is giving out a free lunch to veterans on the day after Veterans Day, Monday the 12th, from 11:30 AM to 3:00 PM. Bring valid military ID with you in case your location requires it. Feel free to call ahead before you head out to see what qualifies as proof of service. If you're a veteran or active military member, stop by a Farmer Boys the day after Veterans Day, on Monday the 12th, for a free Big Cheese cheeseburger. Farmer Boys has locations across California and Nevada. You have to visit the store to receive the free meal; you can't order over the phone. Valid proof of military service is required to get this free Veterans Day meal. Follow that link for all the participating locations. Continue to 17 of 97 below. With proper ID, veterans can enjoy a free appetizer or an order or boneless wings at Glory Days Grill on Sunday the 11th and Monday the 12th; veterans can get the free meal both days. This Veterans Day offer can be had with any valid form of military ID. Veterans and active duty military can stop into their local Fatz on Monday, November 12, and get a free World Famous Calabash Chicken Basket. No other purchase is required to redeem this Veterans Day free meal. However, be sure to bring along your military ID. Fatz is also giving retired and active service members 25% off their entire meal during the whole month of November. Plus, guests who visit Fatz on November 12 also get the chance to win a free Thanksgiving Turkey or Ham Feast worth $100 (there's one winner per location). This year on Monday after Veterans Day, on November 12, participating Claim Jumper locations are offering a free meal for veterans. The menu includes Chicken Pot Pie, Hot Turkey Sandwich, BBQ Chicken Salad, Classic Cheeseburger, Meatloaf & Mashed Potatoes, Coconut Shrimp, Grilled Shrimp, Country Fried Steak, and Black Tie Chicken Pasta. Veterans must show official verification of their service to take advantage of this Veterans Day free meal, and this offer is valid for dine-in only. Another place to get free food on Veterans Day is Rock & Brews. They're giving veterans, active military, and first responders the choice of a complimentary Pulled Pork Sandwich with a side dish or a Strawberry Fields Salad. Some locations may not be participating in this deal, so be sure to contact your local Rock & Brews to check that they are. Proof of service is required. Continue to 21 of 97 below. Active and retired military members can visit Twin Peaks the day after Veterans Day, on Monday the 12th, for a completely free Veterans Day meal. This Veterans Day free meal is valid only the day after Veterans Day, from 11 a.m. through 11 p.m., and might be valid only at participating Twin Peaks locations. Eligible customers can pick anything from this special Veterans Day menu: Chicken Tenders, Philly Cheesesteak, Chicken Ranch, Cheeseburger, or Crispy Buffalo Chicken Salad. These participating Coffee Beanery locations will be giving veterans and active duty military with proof of service a free tall cup of coffee all day long on both Sunday, November 11 and Monday, November 12. Military ID is required to get the free coffee. This Amish-inspired soft pretzel bakery is offering veterans and active military a free Jumbo Soft Pretzel on Monday the 12th. You should call ahead of time to see if your local Ben's Soft Pretzels is participating in this Veterans Day offer. Proof of military service is requested. Visit a participating Chili's on Sunday, November 11, 2018, to get your Veterans Day free meal if you are a veteran or on active military duty. You'll need to show proof of military service to get your Veterans Day free meal. Continue to 25 of 97 below. Starbucks is honoring veterans, active duty service members, and even their families this year for Veterans Day by offering a free coffee on Sunday, November 11, 2018. It's possible that not every Starbucks location is participating, and you should bring military ID with you to get your free coffee. Stop into a participating Applebee's on Sunday, November 11, 2018, to get your Veterans day free meal. Check out the link above for everything you need to know about this Veterans Day free meal, including what sorts of ID they consider valid, the full list of menu items you get to choose from, who is eligible, etc. Texas Roadhouse will be giving away Veterans Day free meals for lunch on Sunday, November 11, 2018, to active, former, or retired military. This is for dine-in only. Hours may vary by location, so be sure to check a Texas Roadhouse near you for specific details. Olive Garden is having a Veterans Day free meal for all active-duty military and military veterans on Sunday, November 11, 2018. You'll need to verify with Olive Garden that you currently are or used to be in the military. Proof of military service usually includes bringing your military ID, U.S. Uniform Services Retired ID Card, Current Leave and Earnings Statement, or Veterans Organization Card. Continue to 29 of 97 below. Veterans and active duty military can stop into any participating Red Robin location on Sunday, November 11 to get a free Red's Tavern Double burger and Bottomless Steak Fries. Be sure to bring your military ID to take advantage of this Veterans Day freebie. Veterans and active-duty military can start their Veterans Day off with a free breakfast at Krispy Kreme that includes a doughnut and a small coffee. No purchase, ID, or coupon is necessary. This offer is valid for dine-in only, not via the drive-through. All locations but casinos in CT should be participating. Find a Krispy Kreme near you to take advantage of this Veterans Day freebie. There are also many other ways you can get free Krispy Kreme doughnuts during the year. For the 6th year in a row, On The Border is giving veterans and active duty military members a free Create Your Own Combo meal where they'll get to choose two selections of tacos, enchiladas, empanadas, mini chimis, and other classics. Eligible guests are also served Mexican rice and beans, plus endless chips and salsa. You'll need to bring military service proof such as a U.S. Uniform Services ID Card, a U.S. Uniform Services Retired ID card, Current Leave and Earnings Statement, Veterans Organizations Card, DD214, or Citation/Commendation. This free Veterans Day meal is only valid for dine-in at participating On The Border near you. Beverages, appetizers, dessert, and gratuity are not included, and selections for the meal may vary by location. Stop into any Outback Steakhouse on November 11, 2018, to get a free Bloomin' Onion and coke product. This offer is for all military personnel that has a military ID. Outback Steakhouse is also giving out a discount of 20% off the total check from November 8 to November 10, 2018, valid for military, police, firefighters, and first responders. Continue to 33 of 97 below. LongHorn Steakhouse is giving away free appetizers and desserts to veterans and active service members who stop in to Longhorn Steakhouse on Sunday, November 11, 2018. Plus, eligible customers also get 10% off their table's total check. You'll need to bring proof of service with you for this freebie such as wearing your uniform or showing Military ID. BJ's will be giving free meals to veterans on Veterans Day, valued up to $12.95. Click the link below to see how eligible customers can also get a free Pizookie! Please contact your local BJ's to get details on their Veterans Day promotion before heading out. A military ID or other proof of service is required. Veterans and active duty military can stop into an O'Charley's location and get a free meal from their Veterans Day Thank You Menu on both Sunday, November 11 and Monday, November 12. This deal is available only at participating O’Charley’s restaurants. Additionally, O’Charley’s provides a 10% discount for veterans all year long. Be sure to bring military ID or proof of service for this free meal in case you're asked for it. To show their support, Dunkin' Donuts is giving away free donuts to active duty military and veterans on Sunday, November 11, 2018. This free Veterans Day donut is limited to one per customer while supplies last, but no purchase is required, and you need to show military ID. It's possible that not every Dunkin' Donuts location is participating, so be sure to call ahead to double-check. Continue to 37 of 97 below. Village Inn will be giving veterans and active military their choice of a free breakfast any time of day on Veterans Day. Choose four V.I.B. INN-credible items to create your breakfast. Grab your military proof before you head out to the Village Inn near you. This offer is not valid at all locations, so be sure to check ahead of time. Also, it's for dine-in only, gratuity and tax are not included, add-on items are not included, it isn't valid with any other offers, promotions or discounts, and only one offer is valid per person. California Pizza Kitchen is having a Veterans Day free meal as well, and both veterans and those in active military duty can take advantage. Stop by a participating California Pizza Kitchen location on Sunday, November 11, 2018, to choose a pizza, salad, or pasta from their special Veterans Day Menu when you dine-in. You'll need come in uniform or bring your military ID or another proof of service to redeem this offer. Veterans and active military can visit Carrabba's on Veterans Day to get a free appetizer. This free Veterans Day offer is valid on November 11 only. You might need to bring proof of service to get the free food, which might include military ID or wearing your uniform. For Veterans Day, Romano's Macaroni Grill is offering free Mom’s Ricotta Meatballs & Spaghetti meals to vets and active military for lunch or dinner on Sunday, November 11. The Mom's Ricotta Meatballs & Spaghetti entree includes the following: house-made beef, veal, pork and ricotta meatballs sprinkled with romano cheese, topped with imported Pomodorina sauce and served over imported, bronze-cut spaghetti. All locations are participating in this dine-in offer, and it's valid for anyone who can present military ID or some other proof of military service. Continue to 41 of 97 below. On Veterans Day, Cracker Barrel is giving veterans a Double Chocolate Fudge Coca-Cola Cake dessert...for free! You can pick the cake or have a Crafted Coffee, like the Goo Goo Latte or Vanilla Latte. All 656 locations are participating in this Veterans Day free food offer this year. Buffalo Wild Wings is having their annual Veterans Day free food deal on Veterans Day, which is Sunday, November 11. All day, veterans and active duty military get a free order of small boneless or traditional wings and a side of fries. This offer is valid at participating Buffalo Wild Wings locations and is for dine-in only. Beverages, taxes, and gratuity are not included in this offer. Proof of military service is required, which can include a permanent or temporary military ID card, DD214, or veteran's card. You may also come wearing your military uniform or bring a photo of you wearing it. Veterans and active military members can visit Little Caesars on Sunday, November 11th, from 11:00 AM to 2:00 PM for a free $5 Lunch Combo. This Veterans Day free meal includes four slices of Little Caesars Detroit-style DEEP!DEEP!™ Dish pizza, plus a 20 oz Pepsi product. You don't need a coupon to redeem this free meal for Veterans Day, but you do need to present proof of service, which can include an ID card with a veteran designation, a DD-214 form, or a current military-issued ID card. In honor of Veterans Day, Bonefish Grill is giving out a free Bang Bang Shrimp appetizer to veterans and military members on Sunday, November 11, 2018. To get this offer, make sure you visit Bonefish Grill with your proof of service, like your military ID. This deal is dine-in only. It's possible that not all locations are participating, so be sure to contact your local Bonefish Grill before heading out so you can verify that they are. Continue to 45 of 97 below. This is the sixth Veterans Day that Menchie's Frozen Yogurt has given out free 6 oz. cups of frozen yogurt to veterans and active duty military. This offer is valid all day long at participating Menchie's locations, and you need to show military ID to receive this Veterans Day freebie. Veterans and active military personnel can visit a participating LaMar's Donuts and Coffee location to get a free donut and 12 oz. coffee on Sunday, November 11. No coupon or purchase is necessary. Just bring military ID with you to redeem this free Veterans Day offer. Veterans, active duty, and reserve service men and women can visit Ruby Tuesday on Veterans Day, the 11th of November, to get a free appetizer valued up to $10. Be sure to call ahead to make sure your local Ruby Tuesday is participating. Proof of service is required. 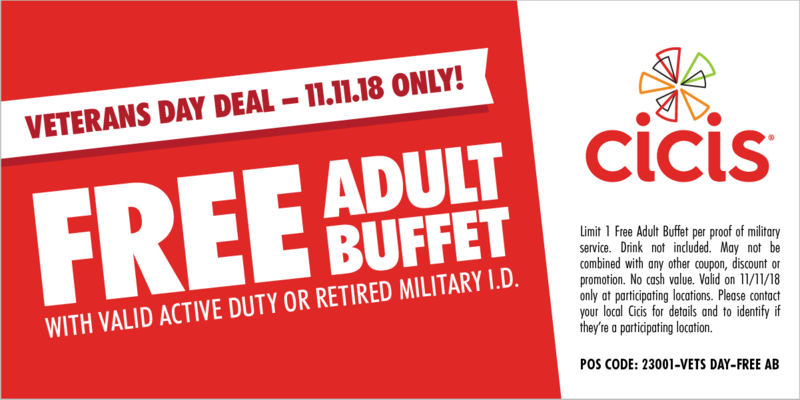 Any active or retired military member with proof of service can get a free adult buffet at Cicis on November 11 for Veterans Day. This includes pizza, salad, desserts, and more. Make sure to bring this coupon with you when you visit your local Cicis on Sunday the 11th. Continue to 49 of 97 below. Any veteran can visit a Perkins Restaurant on Sunday, November 11, for a free breakfast for Veterans Day. This Veterans Day free meal includes a Magnificent 7 breakfast, which consists of two eggs, two strips of bacon, and three pancakes. It's possible that not every Perkins location is participating, so be sure to call ahead of time to make sure. On November 11, MOD Pizza is giving out free pizza or salad to veterans and active military members. This Veterans Day free food offer is valid all day on Sunday the 11th and is valid at all 385+ MOD Pizza locations. Military ID is required when you get your complimentary Veterans Day pizza at MOD Pizza. Visit a Freddy's Frozen Custard & Steakburgers near you this Veterans Day, November 11, to get a free combo meal card. You must be a veteran or active duty military to pick up the card, but it can be redeemed by anyone through November 30, 2018. This Veterans Day, Back Yard Burgers is handing out free burgers to veterans and anyone actively serving in the military. Check with your local Back Yard Burgers before heading out on Sunday the 11th to be sure that they're participating, too. You'll need to come wearing your uniform or have a valid military ID. Back Yard Burgers offers a 20% discount to service men and women all year as well. Continue to 53 of 97 below. Participating Sizzler locations will be serving veterans and active military members a Veterans Day free meal until 4:00 PM on Sunday, November 11, 2018. You'll get to choose from a 6 oz. Tri Tip Steak, single Malibu Chicken, or Half Dozen Jumbo Crispy Shrimp. Individuals will also receive a free side and a coffee, tea, or fountain drink. Bring proof of service such as your U.S. military-issue or veterans group ID card, Current Leave and Earnings Statement (LES), a photograph of yourself in uniform, or wear your uniform to your local Sizzlers. In honor of Veterans Day this November 11, Chuck E. Cheese's is giving out one free personal 1-topping pizza to all active duty, national guard, and retired military members. This Veterans Day free meal offer is valid at participating stores nationwide. Military ID is required. Chuck E. Cheese's has offers for military families all year round, too. Veterans and active military personnel can stop into any Bob Evans location at any time on Sunday, November 11, to receive free breakfast, lunch, or dinner. Choices include Country Biscuit Breakfast, Brioche French Toast, The Mini Sampler, Stack of Hotcakes, Country-Fried Steak Savor Dinner, and Soup & Salad Combo. You'll need to bring proof of military service to get your Veterans Day free meal. This can include a U.S. Uniformed Services (current or retired) Identification Card, a current Leave and Earnings Statement (LES), or a Veterans’ organization card (American Legion or VFW, for example). Guests wearing a military uniform on Veterans Day also are eligible. Friendly's is giving veterans and active military a free Veterans Day breakfast, lunch, or dinner (dine-in only) on Sunday, November 11. If breakfast is chosen, you'll get a Big-Two-Do meal with coffee. Lunch or dinner includes an All-American Burger served with fries and a beverage. You'll need to present your military ID or honorable discharge card to get this Veterans Day freebie at a Friendly's near you. Continue to 57 of 97 below. On Sunday, November 11, veterans and active duty military get a free classic Primanti Bros. sandwich at all locations. This Veterans Day free meal does not include additional items like slides, desserts, and beverages. It's dine-in only and also doesn't include a tip. Proof of service is required, such as DD214, US Uniform Services ID Card, wearing a uniform, Current Leave and Earning Statement, etc. Wienerschnitzel sells millions of hot dogs every year, and for Veterans Day this November 11, eligible customers can have a chili dog and small fries free, plus a 20 oz drink. There are hundreds of locations, but not all of them may be participating, so be sure to contact your local Wienerschnitzel to double-check. This Veterans Day free food is for both active military members as well as veterans who can provide military ID or who show up in their military uniform. Troops and veterans can grab a free small cup of coffee or tea at Peet's Coffee & Tea on Sunday, November 11. Check with your local Peet's Coffee & Tea to see if they'll be participating. If you're a veteran, you can stop into your local Fazoli's on November 9, 2018, up through Veterans Day, Sunday, the 11th, to get free spaghetti with meat sauce or marinara. Not all locations are participating so call before you go. Proof of military service is required before you can get your free Veterans Day food, so make sure you bring valid military ID, your discharge card, or wear your uniform. This offer is not valid for online use. If asked for a coupon code, use 42351. Continue to 61 of 97 below. All Sagebrush Steakhouse locations are honoring veterans and active military this year with a free meal on Sunday, November 11, between the hours of 11 AM and 10 PM. Options include Signature Grilled Chicken Salad, Hand Breaded Chicken Tenders, 6oz Texas Sirloin, Blackened Tilapia, Super Cheezy Chicken, Sirloin Tips, Steakhouse Burger, and Philly Steak & Cheese. Military identification is required, and the meal does include a non-alcoholic beverage. This is dine-in only. All CentraArchy Restaurants will be honoring veterans and active military members this year with a free meal on Veterans Day, Sunday, November 12. Restaurants include New York Prime, California Dreaming, The Tavern at Phipps, Chophouse New Orleans, Carolina Roadhouse, Joey D’s Oak Room, Chophouse ’47, and Gulfstream Café. Individuals will need to provide proof of service for this free, dine-in only meal. Bakers Square is honoring veterans this year on Sunday, November 11, with a free breakfast for anyone who can show military ID or other proof of service. Options for this free Veterans Day food at Bakers Square include Three Buttermilk Pancakes, Three Slices of French Toast, or One Belgian Waffle. Also on Veterans Day, eligible customers will receive a coupon for 20% off their next meal. The coupon is good from November 12, 2018, through November 30, 2018. See where a Bakers Square is near you, and also consider contacting them before you head out on the 11th; it's possible that not all locations are offering this Veterans Day food. Another place veterans, active, and inactive military personnel can receive a complimentary meal on Veterans Day is Tap House Grill. This free meal offer is for dine-in only on November 11 and includes all Tap House Grill locations plus their Half Day Brewing Co locations. Continue to 65 of 97 below. Veterans and active military members can get a free meal and drink at Tijuana Flats on Sunday, November 11. Stop into your local Tijuana Flats to get your no strings attached Veterans Day free meal, but be sure to call ahead since it's possible that not all locations are participating. Military ID is necessary, and the offer is valid for dine-in and take-out only (not online or UberEats orders). Any active, former, or retired military member can get a complimentary entree at any Grub Burger Bar location on Sunday, November 11, for Veterans Day. You must be able to show your military ID or come wearing your uniform before you can take part in this Veterans Day free meal offer from Grub Burger Bar. Grub Burger Bar also provides a year-round 10% discount for veterans who present a valid military I.D. or wear their uniform at the time of purchase. Visit any Carlo's Bakery on November 11 to get a free cannoli — plain or chocolate. Just show your military ID or other proof of service. Veterans and active military can take advantage of this offer at any Carlo's Bakery location in the US. This offer cannot be combined with any other offer or promotion and is only available while supplies last at each location. On Sunday, November 11, veterans and active military eat free at Bandana's Bar-B-Q. This free Veterans Day food offer is valid for meals up to $10. Proof of service is necessary, so be sure to bring your military ID or some other proof with you when you visit your local Bandana's Bar-B-Q. Continue to 69 of 97 below. Active and retired military personnel can visit any Chevys Fresh Mex restaurant from 3 PM to close on November 11 to get a free 3-item combo meal. This offer is also valid at all El Torito, Acapulco, and El Torito Grill Mexican restaurants. You can create your own Veterans Day meal with these options: Tacos, Enchiladas, Flautas, Tamales, and Chile Relleno. However, At El Torito Grill, the complimentary meals will consist of a choice between the following items: Two-Item Combo, Fajita Salad, Mesquite Grilled Chicken Tostada, and Carnitas Yucatán. To qualify for this offer, you must be wearing your military uniform or bring some other form of military identification. Max & Erma's will be honoring veterans and active military personnel by giving out a free Best Cheeseburger in America, Endless Seasoned Fries, and a fountain drink on Veterans Day. This Veterans Day free meal offer is valid only for participating Max & Erma's, so be sure to contact your local restaurant before heading out. This is for dine-in only, and you have to show proof of military service. The Greene Turtle will be honoring past and present members of the military with a free entree from a special limited menu on Sunday, November 11. This Veterans Day free meal is available from 11:00 AM to close, is dine-in only, requires valid military ID, is for any meal up to $12, does not include gratuity, tax, or a drink, and is only valid at participating The Greene Turtle locations. The Greene Turtle also offers military members a year-long 15% discount at participating locations. Cotton Patch Cafe is giving out free Veterans Day meals to veterans and active military on November 11, 2018. You can get a free Chicken Fried Steak or Chicken Fried Chicken as long as you bring along a form of military ID to your local Cotton Patch Cafe on Veterans Day. Continue to 73 of 97 below. Veterans and active duty military get a free slice of pie on Veterans Day at participating Carrows Restaurants. No purchase is necessary, and you'll need to bring along your military ID to your local Carrows. This offer is for dine-in only. 54th Street Grill will be having a free meal up to a $12 value for veterans and active military on Veterans Day. Proof of military service is required. Find out where a 54th Street Grill is near you. Veterans and active duty service members can eat free at Texas Corral on Sunday, November 11, 2018. This Veterans Day free meal includes your choice of the following from this special Veterans Day menu: 6oz Sirloin Steak, Country Fried Chicken, Cowboy Pork Chop, Fajitas, Smokey Roasted Chicken, BBQ Pulled Pork, Bacon Cheddar Burger, Fried Catfish, and a few other Texas Corral favorites. All entrees are served with iced tea, lemonade, or coffee. Visit your local Texas Corral for this Veterans Day free meal and be sure to come in uniform or bring along your U.S. Uniform Services ID Card, U.S. Uniform Services Retired ID Card, DD214, Current Leave and Earnings Statement, Veterans Organization Card, or a photograph of you in uniform. Vets and active military members get free food at TooJay's when they choose from a special Veterans Day menu on November 11. The special menu includes the following: Shepherd’s Pie, Open Faced Turkey Sandwich, Chopped Sirloin, Fish and Chips (lunch portion), Stuffed Chicken Breast, Choose Too Half Sandwich and Soup, Create Your Own Omelette, Broiled Cod with Lemon Dill Butter, Chicken Caesar Salad, Patty Melt, Deli Dogs, Portobello Parmesan, and Liver and Onions. You can redeem this offer at TooJay's when you present your military ID. No other offers can be used at the same time, and this is for dine-in only. Check with your local TooJay's to see if they're participating. Continue to 77 of 97 below. This Veterans Day free offer from Green Mill is for veterans who show proof of service. Eligible customers can pick any one item from their menu (pizza is limited to a small 1-topping deep dish). This offer is for dine-in only. Contact your local Green Mill Restaurant & Bar to see if they're participating. Green Mill also gives out a 10% discount to veterans and active-duty military all year long. All military members and veterans can visit City Barbeque on Sunday, November 11 for Veterans Day to get a free sandwich platter. This Veterans Day free food offer includes not only a free sandwich but also two sides and a regular drink. Every City Barbeque location is participating, and it's valid for both dine-in and carry out. On Veterans Day, November 11, Mission BBQ locations will be giving away free sandwiches and cake to all active-duty military and veterans. Military ID is not required to get this Veterans Day free food offer. Active military and veterans who visit Coco's Bakery on November 11, 2018, will receive a free slice of pie! Just be sure to come in with your military ID so they can confirm that you are or were in the military. Not all locations are participating, so be sure to contact your local Coco's Bakery to see if yours is. Continue to 81 of 97 below. Another place veterans can get free food on Veterans Day is Crooked Pint. Veterans can visit Crooked Pint for free food on Sunday, November 11. Visit their online menu to see their options. Be sure to contact your local Crooked Pint before you head out to make sure they're participating in this Veterans Day free meal offer. Aside from this Veterans Day deal, veterans also save 10% on every meal at Crooked Pint, all year round. Bar Louie is giving away free Veterans Day food on Sunday, November 11, to veterans and active duty military members. This free burger or free flatbread offer is valid at every Bar Louie location. You'll need to show proof of military service to get your free Veterans Day meal. The deal is valid for meals up to a $15 value. Veterans and active duty military personnel can enjoy a free scoop of ice cream at participating Handel’s Homemade Ice Cream & Yogurt's across the country this year on Veterans Day. Be sure to bring military ID and contact them ahead of time to see if your local Handel's Homemade Ice Cream & Yogurt is offering this deal. Another free Veterans Day meal can be had on November 11 at Hurricane Grill & Wings. Veterans and active duty military can stop in on Sunday to pick from a menu of seven items. These are the options: 10 Boneless Wings, Yuengling Beer-Battered Fish & Chips, Teriyaki Beef Bowl, Steakburger, Grilled Chicken Caesar Salad, Chicken Tender Sandwich, and BLT Chicken Tacos. This free meal deal is for dine-in only, coupons and other offers can't be used simultaneously, taxes and gratuity are not included, and military ID or uniform is required. Check with your local Hurricane Grill & Wings to see if they're participating. Continue to 85 of 97 below. Veterans and active-duty military can play and eat for free at Main Event this Veterans Day. The offer is valid on Sunday, November 11 only, from 11 AM to midnight at all Main Event locations. Anyone who can present their military ID or other proof of service will receive a $10 FUNcard that can be used with all Main Event games, as well as their choice of one meal from the Food and FUN menu. On Veterans Day this year, veterans and active duty service men and women can pick any menu item for free all day at Native Grill & Wings. The meal can be anything valued up to $11.99. It's possible not all locations are participating, so you should call your Native Grill & Wings location ahead of time if you want to know for sure. Make sure you bring your retired or existing military ID to get the free meal. It's for dine-in only and does not include alcohol. Sheetz will be giving veterans and active military members a free lunch on Sunday, November 11. The free Veterans Day lunch includes a 6-inch turkey sub and a fountain drink. If your Sheetz supports it, you can even grab a free car wash on Sunday, too. Check with your local Sheetz for specific details about this offer, like whether or not they're participating and if you need to bring in proof of service to get your free lunch. Logan's Roadhouse serves veterans and military personnel a free entree from a special menu this Veterans Day in honor of their service. The free meal offer is valid from 3 PM to 6 PM. Proof of military service is required. Beverages are not included. Find a Logan's Roadhouse near you to take advantage of this free meal — it's not valid in NC; SC; or Augusta, GA; the menu will vary at CA locations. Continue to 89 of 97 below. How about a free beer for Veterans Day? World of Beer is giving out free draft beer (or $5 off the check, depending on where you visit) to all service men and women who come in on Sunday, November 11. It's possible that not all locations are giving away free beer on Veterans Day, so I suggest checking with a World of Beer location around you to see if they are. Be sure to bring along proof of service like a military ID or VA card. For the last six years, RibCrib has been thanking veterans and active military personnel on Veterans Day with a free meal. They're doing it again this year on Sunday, November 11. The eligible customers can choose food from RibCrib’s Menu of Honor, which includes two types of meat and a side. You might want to check with your local RibCrib's before you head out on Veterans Day to be sure they're participating in this offer. If you're a veteran or active military member, you can stop in to Nekter's on Veterans Day, November 11, for a free 16oz smoothie or juice. You can take advantage of this free Veterans Day offer at your local Nekter location, but it's possible that not all of them are participating, so you might call ahead of time to double-check. You need to bring proof of military service with you. If you're a veteran or active military member, feel free to visit Margaritas Mexican Restaurant on Veterans Day to get a free meal. This Veterans Day offer is valid at participating Margaritas Mexican Restaurants in CT, MA, ME, NH, NJ, and PA. Your military ID is required to get the free meal on Sunday, November 11. The complimentary meal is for dine-in only and can't be used with any other discount or offer. Continue to 93 of 97 below. Veterans can visit a McCormick & Schmick's Seafood & Steak location on Sunday, November 11 for Veterans Day to receive a free lunch or dinner. This complimentary meal is for dine-in only, and military ID is required. See the meal options from this special Veterans Day menu. On Veterans Day this year, veterans eat free at Wild Wing Cafe by choosing a Beefy Burger, Awesome Salad, Wild Wrap, or Chicken Sandwich. This Veterans Day free meal is valid at participating Wild Wing Cafe locations only. Beverages and gratuity are not included, and military ID is required. This Veterans Day free meal is on the Tuesday after Veterans Day. Country Cookin will be offering free Veterans Day meals to veterans as well as active and reserved military members the Tuesday after Veterans Day on Tuesday, November 13, from 2:00 PM to 8:00 PM. Orders can be taken from the special Troop Appreciate Tuesday menu, which includes Wrangler Sirloin, Pub Style Fish & Chips, and Famous Chicken Strip. In addition to the entree, eligible customers also get Endless Salads & Sides and a beverage. Be sure to bring along your military ID to your local Country Cookin to take advantage of this Veterans Day free meal. These Veterans Day free meals or free food require a purchase. Tubby's - Buy one sub at Tubby's, and you'll get another one free. Valid military ID is required. Spaghetti Warehouse - Between November 9th and 11th, Spaghetti Warehouse is allowing guests to present a coupon for a BOGO lasagna, grilled chicken alfredo, or spaghetti and meatballs, which is served along with sourdough bread and your choice of salad or soup. A coupon is required, which you can download through the link above. Chipotle - All day on November 11, all active duty military, reserves, national guard, military spouses, and retired military with a valid military ID can get a free meal when they purchase another at Chipotle. Uno Pizzeria & Grill - Uno Pizzeria & Grill thanks active and retired military members for their service by offering a free entree on Veterans Day, November 11, with the purchase of another. This deal does not require a coupon of any type, but you do need to show valid military or veteran ID. Hooters - Veterans and active military who purchase a beverage at Hooters on November 11 can get a free meal from the Hooters Special Veterans Day Menu. Military ID or proof of service is required. Pancho's - Pancho's Mexican Restaurant in Summerlin, Nevada, is offering a 25% discount for all veterans and active duty military members who show valid military ID on Sunday, November 11. Anthony's Coal Fired Pizza - Current and retired veterans will receive a complimentary small pizza with any purchase at Anthony's Coal Fired Pizza. This is available on both Sunday, November 11 and Monday, November 12. Bubba Gump Shrimp Co. - Military personnel and their families get 10% off their meals not only on Veterans Day but every day of the year. Boston Market - Get a second meal free this Veterans Day weekend (Nov 11-12) when you purchase an individual meal with a drink. This is valid for active and retired military, as well as their families. No military ID required but a coupon is needed, which you can get from the Boston Market website through the link above (starting November 5). Fogo de Chao - Active duty military and veterans with a proper ID can stop in to their local Fogo de Chao between Friday, November 9 and Sunday, November 11 to get 50% off their meal as well as 10% off up to three of their guest's meals. This is valid at all US and Puerto Rico locations. Krystal - Veterans and active military members with a valid military ID can get 20% off their meal on November 11 at Krystal. Freebirds World Burrito - All day on Sunday, November 11, active, retired, and reservist military members get a BOGO meal valid for any fully-size entree. Hopdoddy Burger Bar Free Burger - All day on Sunday, November 11, every Hopdoddy Burger Bar location will give 50% off to any veteran, active, or reservist member of the armed forces. The half-off deal is valid for anyone joining the eligible guests, too. Continue to 97 of 97 below. Below are even more Veterans Day free meals, but they're valid at only one or two locations. Hoss's Veterans Day Free Meal - If you're a veteran, you can get a free meal at Hoss's on Monday, November 12, 11 AM to 9 PM. The meal options can be found through that link above. Be sure to bring your military proof to your nearest Hoss's. It's possible that not all locations are participating. Muscle Maker Grill Free Meal - One way to get a free meal for Veterans Day is to visit Muscle Maker Grill on Sunday, November 11. Guests can choose from one free salad, wrap, entree, or flatbread so long as they can provide proof of military service. Some Muscle Maker Grill locations might not be participating. Auburn Veterans Day Parade and Community Ceremony and Luncheon - A free lunch is provided after a veterans day parade in Auburn, CA on November 11. Elks Lodges Veterans Day Cook-Out - On Saturday, November 10, San Angelo Elks Lodge is hosting a Veterans Day free cook-out with hot dogs, hamburgers, and chips right after a parade, between 11:00 AM and 3:00 PM. This is valid for vets and their families. Melt Shop 10% Discount - Veterans get 10% off their bill in honor of Veterans Day. Sweet Pea's Public House - In addition to 10% off all year long, on Veterans Day this year, Sunday the 11th, veterans eat free at Sweet Pea's Public House in St. Paul, MN. Harriet's Inn - On November 11, 2018, veterans can also visit Harriet's Inn in South Minneapolis, MN, for a free Veterans Day meal. Arooga's Free Veterans Day Meal - With military ID, vets can grab a free meal at any Arooga's location (with the exception of Patchogue, NY) on Monday, November 12. WingHouse Bar & Grill - With a valid retired or current military ID, customers can grab a free order of wings, a burger, crab cake sliders, or a buffalo chicken sandwich on Sunday the 11th at participating WingHouse locations. Yard House Veterans Day Free Appetizer - Visit a Yard House location on November 11 to get a free appetizer in honor of Veterans Day. This offer is good for veterans and active duty military who can show valid military ID. McGrath's Fish House Free Meal - To honor veterans this year, McGrath's Fish House is giving out free food on Sunday the 11th. You get to choose between six free meals. Calhoun's Veterans Day Free Meal - Calhoun's Restaurant in Tennessee has a special Veterans Day menu that veterans can eat for free off of on November 12. Bring along proof of service to your closest Calhoun's. Brunswick Elks Lodge Free Lunch - Veterans and their families can have free lunch at Brunswick Elks Lodge in Troy, NY, from noon to 2:00 PM EST on Saturday, November 17. 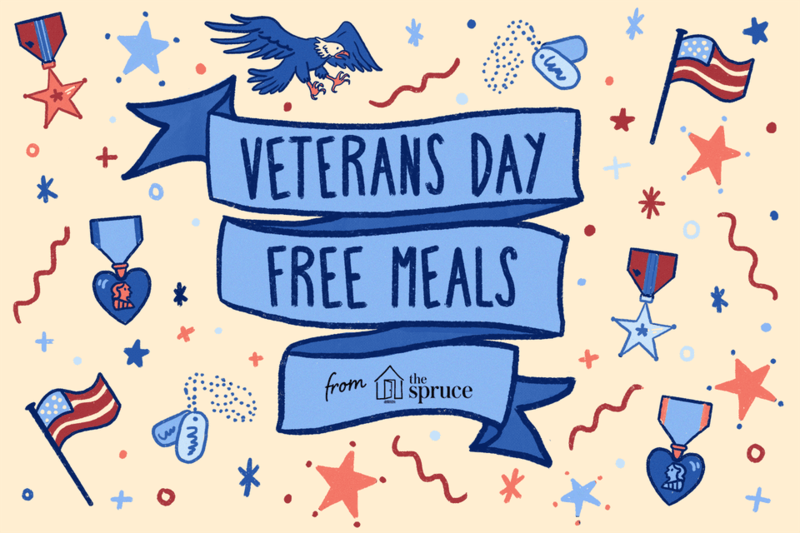 Fire+Ice Free Veterans Day Meal - At Fire+Ice in Boston, MA, on Monday the 12th, veterans, and active duty military receive a free meal. Military ID is required. Looking for More Military Freebies Like These? Lots of military freebies are available all year round and Memorial Day is also a time where veterans can get free stuff. You'll also want to check out this list of current free samples you can request.